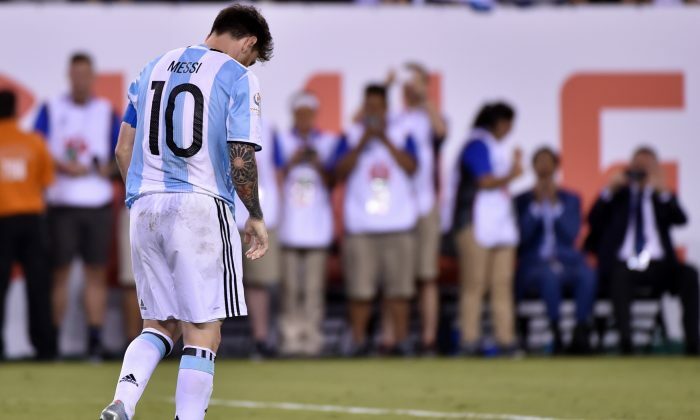 It seems Argentina isn’t ready to imagine life without Messi yet. Argentinians are imploring soccer star Lionel Messi to stay with the national team—even President Mauricio Macri. Soccer legend Diego Maradona also spoke out, and thousands of fans will hold a rally in Buenos Aires on Saturday. Messi hinted he would retire after missing a penalty kick and losing the Copa America final at the Metlife Stadium in New Jersey, on June 26. The Fútbol Club Barcelona player has taken the Argentine team to four finals, but has not been able to win a trophy. Messi was visibly emotional after his penalty kick, kneeling on the grass with his head down right before Chile scored the last goal to win the tournament. He was then seen with his hands on his knees in tears as teammates consoled him. His reaction immediately started trending on social media, especially after he said he would hang up his Argentine jersey for good. Fans created a Facebook Page for an upcoming event in which people will rally for Messi to stay on the team. The event will take place in the Argentine capital at the Obelisco de Buenos Aires on July 2. More than 50,000 people say they are going to attend. Meanwhile high-profile figures have asked Messi to stay. Argentine President Mauricio Macri reached out to Messi on the phone, according to local media. Macri asked Messi to stay on the team. Although it is not known how Messi answered the president, some say Messi cried during the conversation. The president also took to Twitter and started a hashtag, asking the superstar to stay on the national team. “More than ever I feel great pride for our team. I hope the joy of seeing the best in the world will continue for many years to come,” said Macri with the hashtag #NoTeVayasLio, which translates to #Don’t Leave Lio. Popular Argentine-born singer Ricardo Montaner wrote a letter to Messi asking him not to go. “Yesterday we saw you crying, but don’t think you were the only one. Yesterday even the Pope cried…literally,” the singer said. He also told Messi, who has two young sons, to think about how he will explain his retirement to his children. Even the man who was caught saying Messi lacked leadership ability for the national team—1986 World Cup winner Diego Maradona—is asking Messi to reconsider. “He has to continue!” Argentina’s soccer legend Diego Maradona told Argentina’s La Nacion newspaper. “He must go on because he has it in him and will last for a long while,” and “he has what it takes to become world champion,” he added. A teacher, who wrote a letter to Messi asking him to stay, has gained popularity in Argentina. “Even with all the love and dedication I put into my job, I’ll never have from my students that wonderful fascination that they feel for someone like you,” she said, according to local media. “Today they’ll see their biggest idol fail,” she said, adding that Messi shouldn’t let the “mediocres,” the critics, win. “Please do not retire, don’t let them believe that in this country it’s only important to win and be number one,” she said. Argentinians are not the only ones who want Messi to stay with the national team. “Since I have known you to exist as a player, I’ve never stopped watching you,” said a Messi fan from Puerto Rico on the rally’s Facebook page.